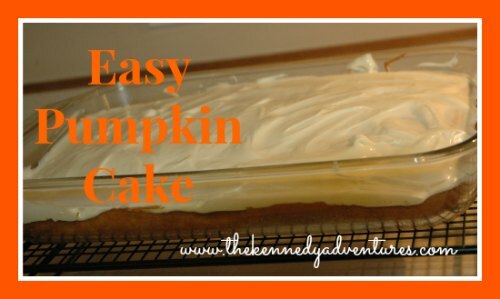 Quick and Easy Pumpkin Cake with Cream Cheese Icing - The Kennedy Adventures! As the holidays approach, your calendar may be filling up with many parties and potluck dinners. 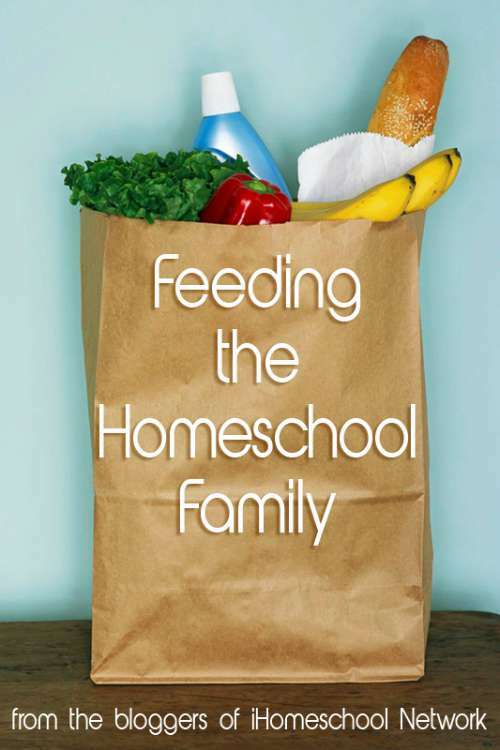 You’ll have to expand your grocery list and start adding items for baking and creating dishes for the holiday season. 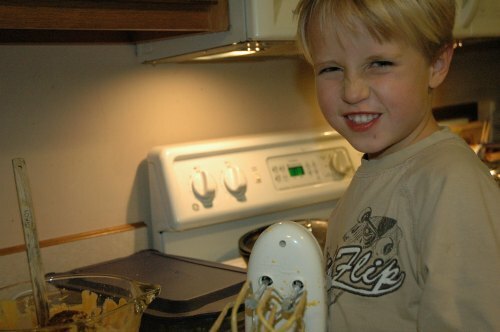 When I’m thinking about signature dishes to bring along to a holiday dinner, I put my kids to work. I let them peruse my Pinterest boards, and set them on a mission to find a dish that is easy, but a crowd pleaser. 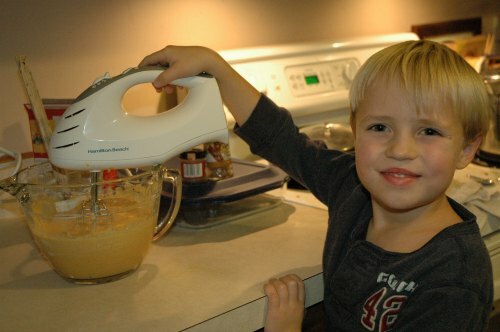 My kids love desserts made with pumpkin, so we decided on this Quick and Easy Pumpkin Cake. We modified it to our own tastes and added our Cream Cheese Icing, since my kids requested it! 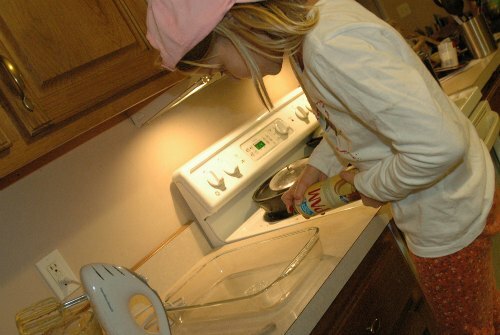 Spray 13×9-inch baking pan with PAM® cooking spray. 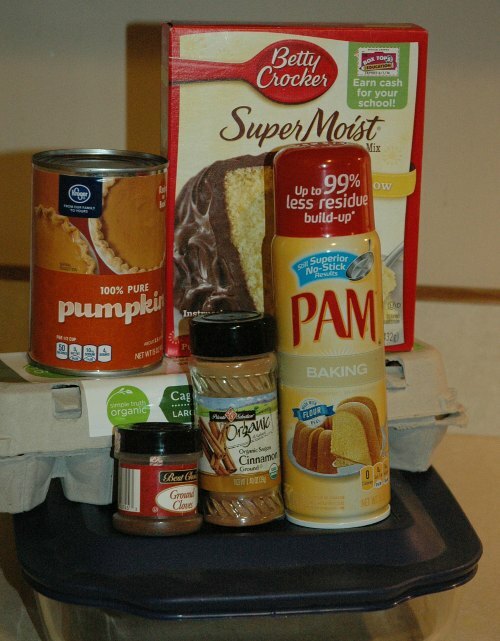 Combine cake mix,eggs,canned pumpkin, water, spice and sour cream in large bowl. Beat with electric mixer on low speed just until moistened. Beat on high speed 2 minutes. Bake 25 minutes, or until wooden pick inserted in center comes out clean. Cool. When cake is completely cool, apply icing. Let cream cheese soften, then cream the cream cheese. 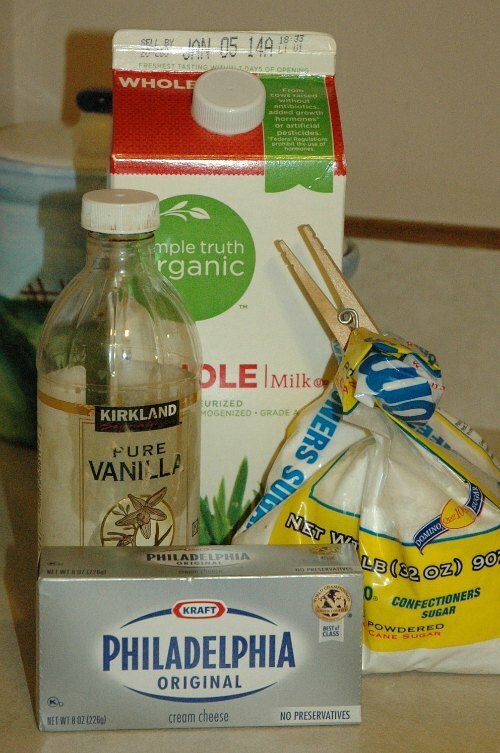 Add vanilla and milk, mixing well. Slowly fold in powdered sugar. Icing will have to be refrigerated. I’ve had some recipe disasters in the past, like cheesecakes that don’t ‘set up’, or lemon bars that we had to chisel out of the pan. As a busy mom, here are my Smart Tips for making your holiday dishes a success, so you can spend more time with your family. I can’t tell you how many times gotten halfway through a recipe and realized that I don’t have enough eggs, I’m out of vanilla, or the kids have eaten half of the cream cheese. Double and triple check the recipes and your ingredient list BEFORE you get started. 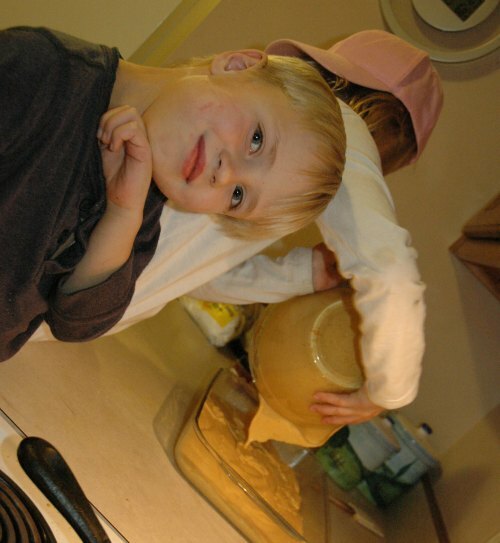 My children ADORE helping me in the kitchen, but I have to set up rules and boundaries. Instead of having three children clamoring and fighting for a task, I assign them before we get started. Someone is responsible for helping me mix, someone is responsible for greasing the pans, while another child helps pour the batter or assemble the meal. This system helps me to stay sane, while making sure everyone gets involved and has some individual time with me. I can’t cook with Maeve underfoot, so I need to make sure I have her occupied before we begin. I set her up with special toys or wear her on my back, so that she can see what’s going on, but not get hurt. We made Lemon Bars last summer, which turned out to be a flop. Somehow, I managed to forget to grease the pan with non-stick cooking spray. The lemon bars were delicious, but we just ate them out of a pan with a fork. Argh. 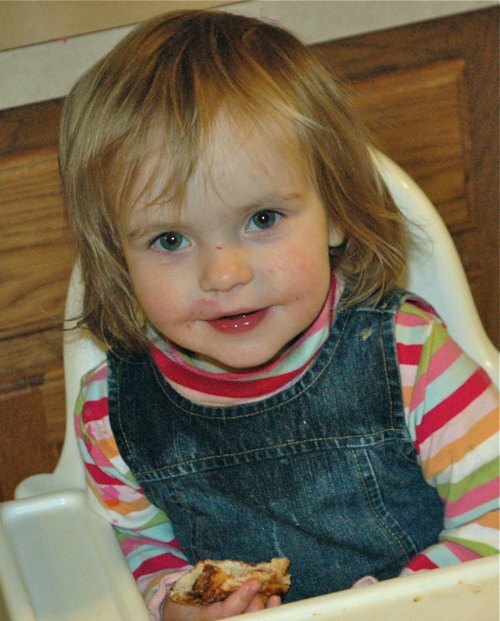 Rachel has always been in charge of greasing the pans for casseroles, cakes and muffins. 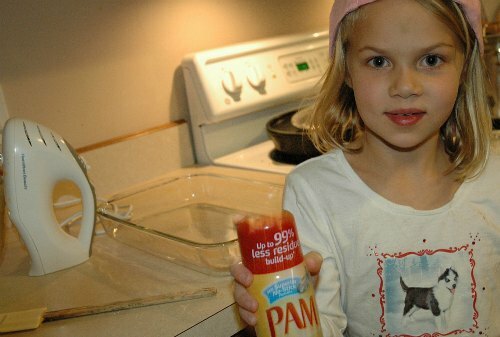 She was thrilled to see the PAM spray, since it meant she didn’t have to get butter on her hands! PAM® has been a baking staple in my house since I was a little girl – I’ve even bought giant multipacks from warehouse stores for holiday baking! Today, PAM® has seven specifically formulated non-stick cooking sprays to make every meal a success! The Original, Baking, and Butter spray varieties leave 99% less residue than margarine based or bargain brand cooking sprays. This means your dishes won’t stick, and you’ll spend less time soaking and scrubbing dishes! An added bonus? Zero calories for those who are dieting. We’ll be linking up to our favorite linky parties this week. Go take a look! I always love baking a pecan pie and a pumpkin for Thanksgiving. I also love to have cornbread dressing. It is a recipe that my mom has made for many years. YUM — I’m a big fan of cornbread dressing, too. Great to see you, Joy! I am the master pumpkin pie maker over here! Win a pie dish! You didn’t say this post had a prize! Woot! My family loves a chocolate pecan pie. But my favorite holiday dish is a cranberry salad with fresh cranberries, celery, walnuts, fresh orange, and pineapple. Chocolate pecan pie — I believe that’s better referred to as a Derby Pie (at least here in Louisville). 🙂 I love Derby Pie so much I ask for it for my birthday ‘cake’. I think your cranberry salad sounds delicious. A pie dish? That would be so wonderful! Okay, let see . . . favorite holiday dish? Apple pie. With fresh vanilla whipping cream on top. 🙂 Yum. I’ve never made an apple pie — hanging my head in shame. I HAVE made fresh whipped cream, and it’s delicious! Ooh! I’d love to win this since I’m the designated “pie maker” in my extended family! 😉 Our family favorites are pecan pie, chocolate pie, coconut cream pie, and of course, pumpkin pie! Girl! I’m not surprised in the least that you’re the master pie maker! You’re quite the cook! My favorite holiday dish is sweet potato pie. You can hardly tell the difference between that and pumpkin, but I like sweet potato more. That’s a new idea! I’ll have to give that a try! My sister in law makes sweet potatoes for Thanksgiving that are more like a dessert, too. Thanks for coming by! 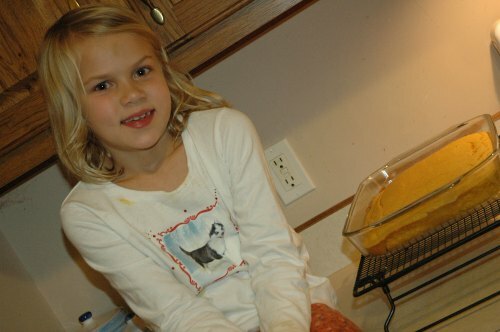 I think my favorite Thanksgiving dish would probably be Pumpkin Dump Cake, a recipe I got from another homeschool mom. All right. You’re going to have to share this recipe. The first thing that came to my mind was a pecan pie, too! My dad always loved that one, so we made it often for the holidays. Thanks for the chance! WHOOP! Congratulations, Karyn! You’re my winner!!! 🙂 I’ll be emailing you! Two holiday favorites, sweet potatoes minus the marshmallows, and pumpkin pie with losts of whipped cream. What? No marshmallows? I love marshmallows! Thanks for coming by, JOann! First ~ your kids are absolutely super cute! I love Pumpkin Pie with lots of real whipped topping this time of year and eat lots of it! Never had pumpkin cake but this looks yummy! Easy peasy too! Thanks so much, Robin! We’re pretty proud of them! My kids LOVE the pumpkin cake! My favorite holiday dish is sage and onion stuffing. I’m a huge stuffing fan, as well! Yum! I know! They should have pumpkin pie all year round! I love my mom’s apple pie. Not kidding. It’s the best. My kids love apple pie, but not me. I should learn how to make it for them! Thanks so much for the opportunity to win a pie plate from one of my favorite cookware manufacturers. My favorite is Italian Cream Cake with lots of pecans. Italian Cream Cake is a favorite of a lot of my friends, too! Yummo! That cake looks so good.